Native to Queensland and the coastal regions of Northern NSW, Backhousia citriodora is grown as far south as Victoria. 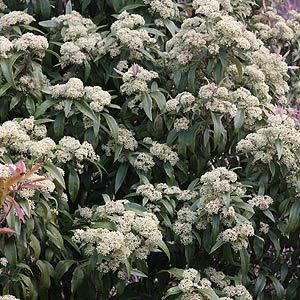 Commonly known both as the Lemon Scented Myrtle and the Lemon Ironwood, this is a plant that could be used as an alternative to the Lily Pilly as a medium sized hedging plant. Growth habit is upright and compact with foliage held tightly to form a dense bushy habit. The foliage is used for food flavouring. Reaching around 5 -20 m in height when in cultivation (much larger in its native rainforest habitat), but easily pruned to size. Fragrant foliage that is crushed and oil is extracted. Nice shiny foliage and masses of creamy white flowers from spring through to autumn. Easy to grow and very hardy in a well drained humus rich soil. Backhousis Citriodora is suitable for growing in containers. Being a rainforest tree part shade in hotter areas is advisable. A cool root run will promote growth. When pruned after 1-2 years growth it makes a great hedging plant. Attractive cream – white fluffy flowers in summer through to autumn. Propagation of Backhousis Citriodora is not difficult, cuttings can be taken in early autumn and when a rooting hormone are used the strike rate is good. Also possible from seed. Botanical Name – Backhousis Citriodora. Common Name – Lemon Myrtle. Soil – Well drained, tolerant of a range of soil conditions. Height – To 20 metres, often smaller and easily pruned. Spread – To 5 metres on a large specimen. Foliage – Deep green and fragrannt. Frost tolerant – Light frosts onlywithout leaf burn.